The Trek Collective: Star Trek Magazine goes digital. 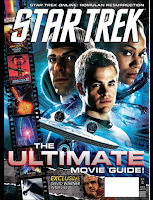 Star Trek Magazine has launched a digital version of the magazine on the Zinio service for pc, mac and ipad. The digital magazine comes at a discount from the usual print price and can be bought via subscription. The recent movie edition of the magazine (which is a rather good issue IMO) is the first issue to go digital. And can be sampled on Zinio, here.